Powerfully simple reporting tool that provides the information you need to receive full MIPS incentives as well as helping you improve workflow. Unified tools that keep you in touch with your patients before and after their office visit. 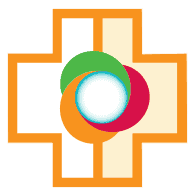 Coordinated, ongoing care between providers, hospitals and other care providers for the population of patients they serve. 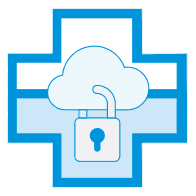 Removing the worry and expense of hosting your EMR in-house. An application hub for OEM vendors to integrate services. Tangible Solutions serves as your strategic advisor for getting the most out of your investment in information technology systems. Today’s medical practice is under great pressure to meet various mandates, or risk taking a substantial financial hit. As your partner, we take the time to listen to you in order to gain a complete understanding of the challenges you face trying to meet the requirements placed on your practice. We understand that doctors simply want to practice medicine and give their patients the best care they can. Getting bogged down in the details of implementing patient portals, interfaces to registries, integrating lab orders and results with the EMR, etc is just not what you signed up for. That’s why we are here to help. 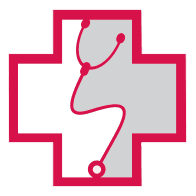 We have over 20 years of experience assisting medical practices with their IT needs. 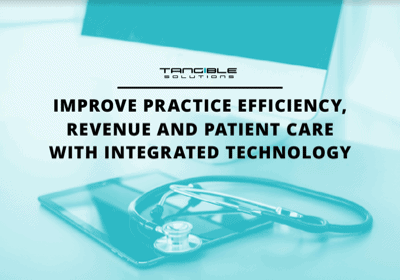 From patient engagement services to MIPS reporting, to data interfacing solutions and beyond, we can implement the right solution for your needs so you can stay focused on patient care. Give us a call today to learn how we can help you stay focused on patient care while meeting the demands of a modern medical practice. 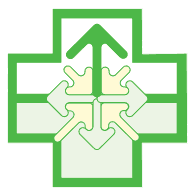 The seamless way to make your systems work in harmony with others in the marketplace. 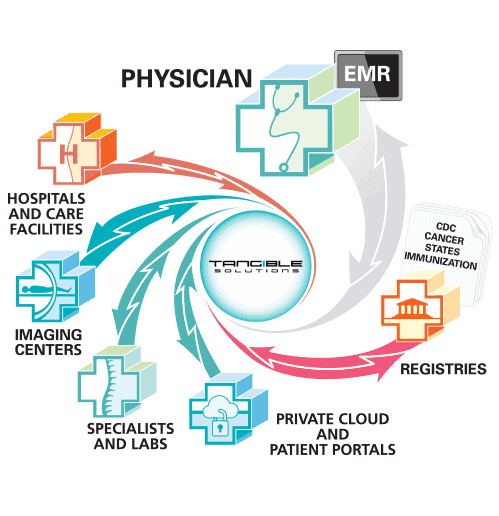 After several years of working with medical practices to connect their EMR systems with various other systems, we realized that the need for connecting and integration would continue to grow. In response, we created Happe or Healthcare APPlication Ecosystem as a way for system vendors to work with us to better facilitate the exchange of information. Since those early days, we have worked with many vendors to either build an interface or integrated our services directly into their product. It isn’t always practical to build the necessary infrastructure to connect all of your customers to a third party resource. Especially considering we may already have a connection through another partnership. 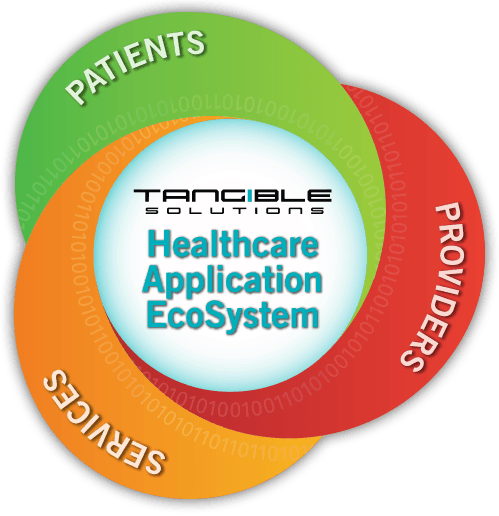 Tangible Solutions partners with a broad spectrum of suppliers of healthcare equipment, systems, software, labs, and government agencies to provide data exchange services that are seamless and secure. By developing interface programs tailored to your customers’ needs, we can enable your systems to integrate seamlessly with labs, information exchanges, suppliers, manufacturers, institutions, registries and more. Whatever the communication protocol/format, Tangible can teach it to speak user and customer satisfaction. Give us a call today to see how we can help build the connection you need. We want to provide smaller practices the same opportunities that exist for large practices. If I decided to close my billing service and go work as a consultant for someone, they are the only company I would want to work for. The way their business model is set up and the way they care about customers makes Tangible Solutions truly unique. With Tangible providing our hosting solution, updates are so easy, and I never face extra hours or surprising inconveniences. Working with them is amazing. Tangible Solutions has proven to us once again how essential it is to have a responsive IT solutions team to support us quickly, day-in and day-out. They made our transition back so seamless—it’s like we never left. And now that we’re back with Tangible Solutions, everything is smooth sailing.